Life is full of opportunities and we try to make them work for us from time to time. But as our work and family takes center stage we could not make Money work for us. Money needs time and efforts on our part to multiply or at least retain its value over the years. Financial Freedom is something we all work towards knowingly or unknowingly based on the facts and figures or based on friends advice or based on our regular research from newspapers and other online materials. But not every decision works in our favor but now there is something that can help us take right choices with just a click of a button in our smartphones. I was looking for right investment products as I am travelling all the time, sometimes far onsite trips and can’t get the SMS/OTP that are generated for the bank apps which wastes a lot of time. Also it needs daily study to think about which are the right stocks or mutual funds to purchase and have in my portfolio. I am using ICICI Demat account for the past 6-7 years but then I wanted some app that can help me make the right choice of investment products but mainly my time goes in changing password every 14th day and using the password grid etc. I started looking on android Play store and found a lot of financial and banking apps which I installed one by one and found out that FISDOM to be the best among them all in user interface and several other features which I will discuss in this blog post. But in the ever growing market of smartphone apps where bank and financial agencies have their own apps what is so different about FISDOM? 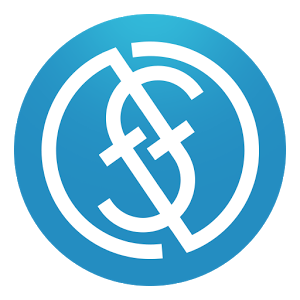 FISDOM is an investment management product which gives your financial wisdom to take the right decisions at the certain age with your risk capabilities to grow and make your investments work for you. FISDOM is available on Google play and on the web and soon iOS version will be out in Apple store. Currently, a large number of people like me want to invest their money in stock markets and mutual funds but they are stuck in savings and fixed deposits to earn the least interest rates possible which sometimes just matches the rising inflation we are facing in India. Then there are much more challenges like no online application forms and complicated KYC process, no time to go to the branch with traffic and long queues, lack of financial understanding about the products and options available in the market. Above them all it takes a while to understand the market and it needs certain amount of time daily to make the right financial decisions. FISDOM is built keeping in mind each of these problems and to help non-savvy person to get over them comfortably or people like me who doesn’t have time to research the market themselves. 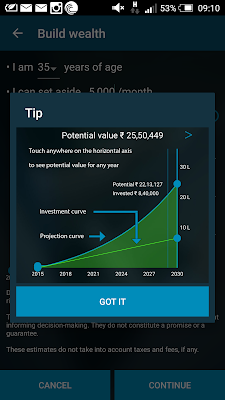 The app makes it very easy to a) become an investor b) make investments (currently in equity, debt and liquid mutual funds) and c) track money in a jargon free manner (No need to read the red herring prospectus unless you want to). This is one of the best features that even if I can’t track personally the SENSEX or NIFTY myself due to office or travel, this app will help me make the right choice by offering right products based on past performance. Second best features is the online rather “smartphone” KYC process for FISDOM which is very seamless and leverages the phone camera and make it super easy for any user to get KYC compliant. Essentially I just took a series of photographs for my PAN card, address proof, cheque leaf, a selfie (of course smiling one as always) and that’s it. So no more filling of application forms and submitting it manually to a particular branch or so. The app has a very user friendly interface and a 4 digit pin helps you to keep it secure too. The app consists of several tabs to make it easy for users mainly – Invest, View, Register, Learn, Help and other system specific details including changing password etc. 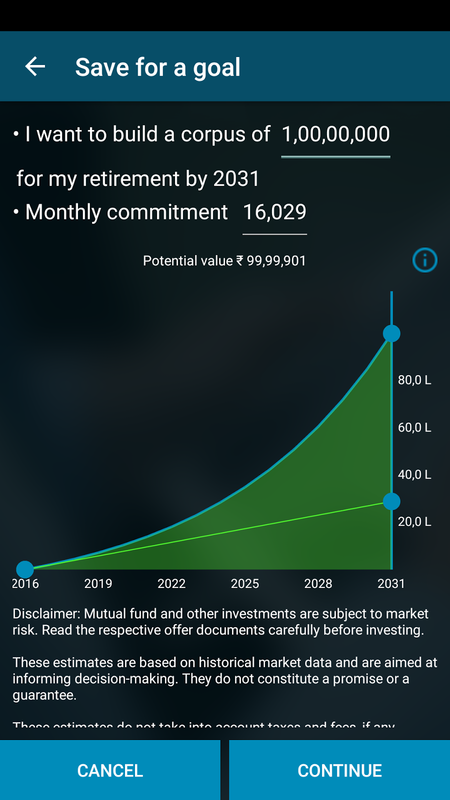 On the Investment tab, the app allowed me to check my long term or short term goal scenarios - SIP, tax saving, investing surplus money and goal based investing (retirement etc). 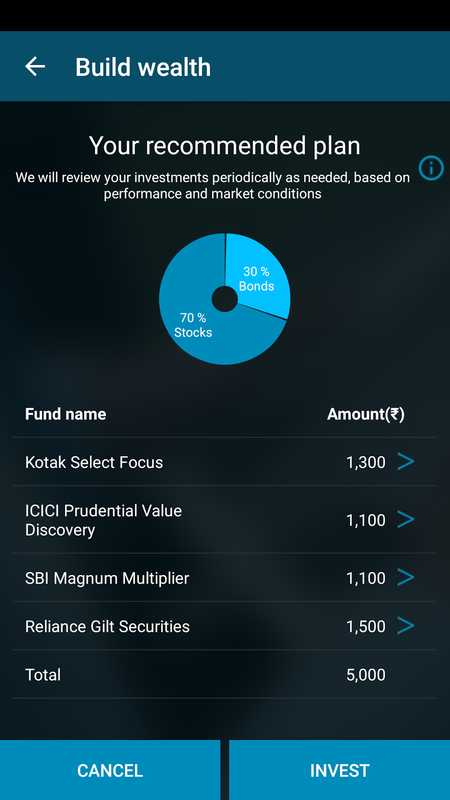 Investing surplus money has further three sub use cases which are investing into a) safe places like liquid funds, b) bond portfolios c) long term equity portfolios. The third feature that I loved about FISDOM is that the app allowed me to decide on my asset mix (stock and debt) based on the goal I have in mind and then recommended me the best funds based on this asset mix. I could play with how much risk I wanted to take without having to depend on an advisor. 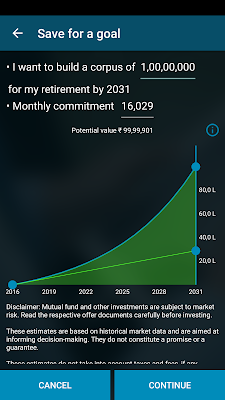 I could actually check several options by playing with the risk pattern to check what kinds of options comes up and whether that can help me achieve my long term financial target. Building wealth is definitely my goal and FISDOM has helped me stay on target and reminds me that, it requires a strong discipline and systematic investment over a long period of time to achieve the same. Unlike brick and mortar advisers, Fisdom's recommendation is purely based on internal research and is not influenced by commissions given by AMCs to the brokers. The research takes into account a variety of factors including past performance, underlying portfolio, fund manager track record, view on the markets etc and also customer's age. As financial markets gets changed every day the information gets updated in the app to recommend the best options available. Viewing portfolio is very simple - there are no complicated jargon and relative returns. Money is just treated as money and you can track your portfolio in multiple levels. Fisdom also helps you keep track of your tax liabilities. You can also check if you are invested in Tax saving instruments to save Income Tax also. One another feature I loved is the option to withdraw money in a single click from any investment at any time (yeah, on a trading day only – I suppose) and amount will come back to my bank account for any emergency needs. Knowledge is something that you develop over the years with reading or experience but there is a learn module in FISDOM where the app users can learn about various financial terms in their free time or breaks. 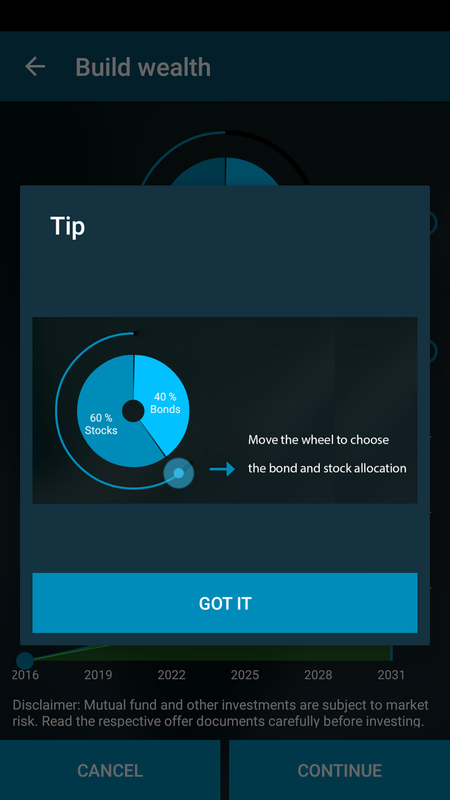 I have the app installed on my Android phone and the options the Fidsom shows to invest in are best in trade but in the end as it all depends on the market and economy of the country, the risk we take is ours. FISDOM really makes us financially wise but now we have to trust ourselves to start investing early to build the life we always wanted to.